Home » fun stuff » Just in the Nick of Time…Almost! Just in the Nick of Time…Almost! We almost did not go on our walk this morning. I went to change and saw drops of water on the window. Blast! Is it raining? Stood outside in my skivies… nope, all good. You’re in luck Zeke! Off we go. Holy toledo! This warmer weather has melted a lot of the snow on the streets (definitely didn’t get enough for the plows to scrape off the smaller streets) and, with the help of the wind, turned it into an icy, slushy minefield. I wonder, do you burn more calories as you move across the ice à la Bambi? I’d like the think so – between that and the sudden rush of heat that hits your whole body as you manage to avoid the fall – there must be some extra being burned! Time to change directions, methinks! 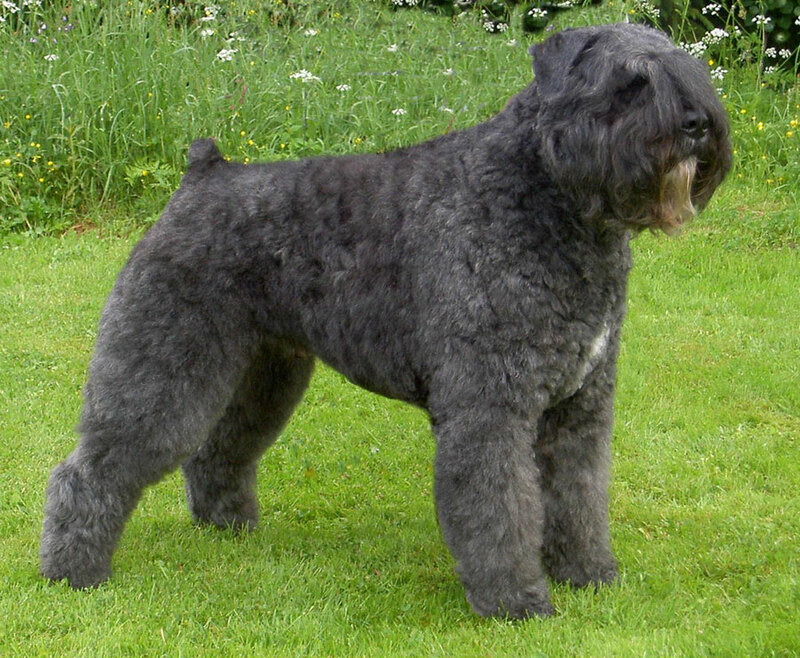 We turned off onto another street and ran into Porthos, a most friendly 1 1/2 year old Bouvier des Flandres. My phone was dead so I was unable to take a picture…. Grrrr! They did indeed have lots of fun but his human, Roxanne, needed to go to bed (she works the night shift). We’ll just have to try to time our walks in the future! Off we went, enjoying the day, grey as it was. I guess the greyness forced me permitted me to see my surroundings without the distraction of the sun. More and more Christmas decorations are going up and some really do a beautiful job! 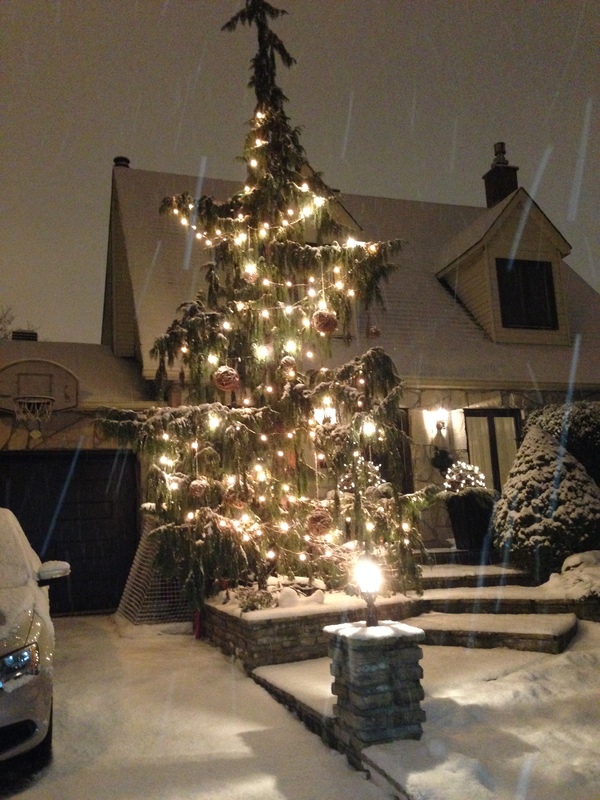 I took this one the other night (so much prettier at night than during the day) mostly because I am not a fan of this type of tree, the Nootka falsecypress, or Alaska Cedar (I find they look half-dead) but had to admit that the homeowners did a wonderful job dressing it up! So, after another run in a park, we started back. What? Is that a raindrop I feel? Oh no! We’ve more than a kilometre to go! I started trying to figure out which way would be shortest then stopped myself. Seriously? Am I made of chocolate? No. It sure as hell did not bother Zeke! I did, however, pick up the pace as much as I could (see Bambi reference above), as did the wind. We could hear it howling between the houses and trees. It suddenly felt spooky which is kinda funny considering it was 11:00 am! Home sweet home for a nice cup of green tea! This entry was posted in fun stuff, Uncategorized and tagged Bambi, Bouvier des flandres, Christmas decorations, rain. Bookmark the permalink. I bet that cup of warm green tree tasted very nice after a walk like that:). I feel cold just looking at the photo. It’s actually sunny here today, but 22 degrees Fahrenheit. It’s actually quite warm here – don’t be fooled by the picture! It’s 43 F right now.. I love those type of trees as they remind me of the kind of trees you would find in a Lord of the Rings novel. Your neighbour did a really great job of decorating and with the snow falling it looks kinda ghostly…which is cool!! Thanks for sharing and stay warm this weekend! My best to all. You too, gonna be a cold one! Make sure you bundle up should you decide to go out!